The entries, by year and in reverse chronological order, separates authored books, edited book, published papers, (usually Web "published") lecture notes, reports, (usually Web "published") development reports, and administrative, in this case UNU-IIST annual, reports. For statistics on such typed documents, pls. cf. Page . is finally being published, after 3 years with editors. likewise, after 2+ years with editors. Authored Book(s): [35,36,37] Chinese translation of my 2006 book. Authored Book(s): . Publication of my 2006 JAIST reports. Authored Book(s): [48,49,50]. English republication of my 2006 book. 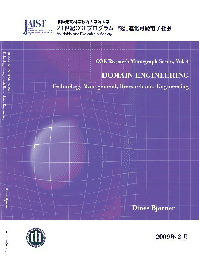 Edited Book(s): , Springer's Web page on this book. Guide to using these books in nine courses. Spent most of the time, at NUS, Singapore, besides lecturing, writing [61,62,63].